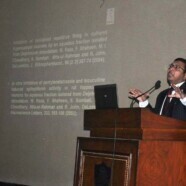 Speers Chemical Society (SCS) at Forman Christian College held a lecture on ‘Developing New Paradigm for Drug Development – Our Research’ on 10 January 2012. The lecture was supervised by Professor Dr Dildar Ahmad (Chairman Department of Chemistry) and Professor Dr Seemal Jelani (Advisor SCS). The guest speaker on the occasion was Dr Muhammad Iqbal Choudhary who is a renowned scientist and Director International Centre for Chemical and Biological Sciences, Karachi University. He highlighted the work being done on drug development in Pakistan and talked in detail about Epileptic Seizure and toxicological effects of drugs. He acknowledged the students for their research contributions towards this ailment. The objective of the activity was to provide adequate knowledge for therapeutic uses of plants. Faculty members from the Departments of Chemistry and Biology attended the seminar along with many students.